Antonio’s Burritos is proud to be family owned and operated, just as we are proud to serve the beautiful city of Loveland. Because we care about our customers and their satisfaction, all of our food is made fresh daily and to order. We offer authentic, “home made” Mexican food at a great price and we’re the only Mexican restaurant in town who will deliver your food to your door on orders over $15. 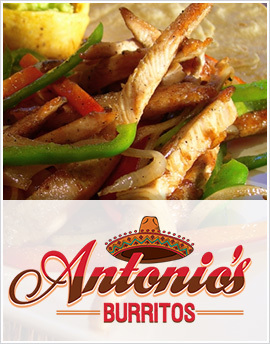 If you’re looking for fast, friendly, local service, then look no further than Antonio’s Burritos. We are big enough to handle large orders, but we are still small enough to greet our customers by name. The next time you need a lot of good food for a group breakfast, a big family dinner, or even a larger event like a wedding, try ordering Loveland’s best burritos from Antonio’s. You’ll never be disappointed in our selection or our quality and after just one bite, we know you’ll become a customer for life. Like us on Facebook and follow our daily breakfast and lunch specials. We’re always cooking up something new and delicious in the kitchen so don’t miss out. Also, be sure to keep an eye on our coupons page for our latest deals. If you ever have a question about our menu or would like to place an order with us, please contact us right away! There’s no excuse to settle, Loveland. We’re offering you premium burritos at great prices, so eat in, pick up, or get delivery today!